Starting a bullet journal is a HUGE project. And honestly, it can seem a bit intimidating, especially when you’ve never done anything like it. But your first bullet journal doesn’t have to be a huge source of anxiety either. I was thinking the other day sometimes I wish when I started that I had more perspective from other people who had already finished their first bullet journal. I’m currently on bullet journal number 3. I’ve learned a lot since I completed my first month in October 2016. Yet I can’t help but wonder if there are things I would have done differently knowing information that I didn’t have from back then. 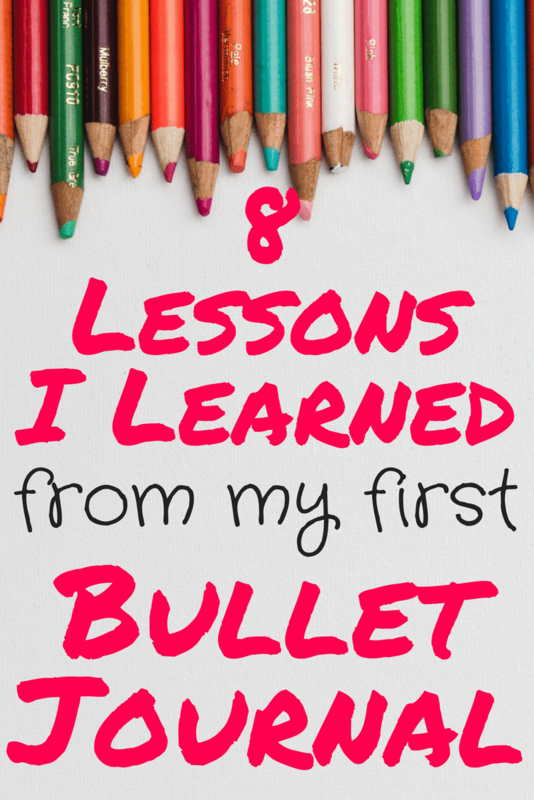 I thought about the lessons that I’ve learned in the process, too, and figured maybe you want some insider perspective on what I learned from my very first bullet journal! 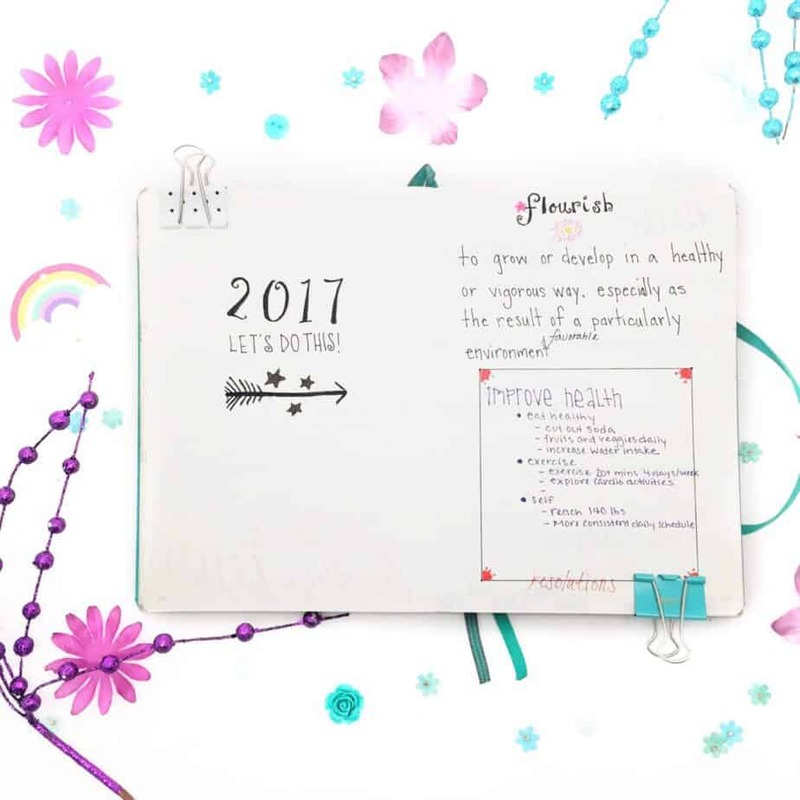 So this is a personal post, all opinions about bullet journals are of my own. 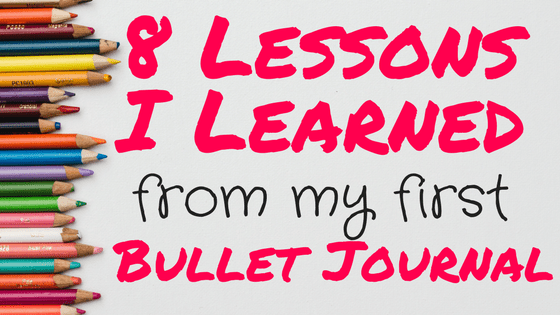 There is no one right way to bullet journal, and you may find the lessons I learned from my first bullet journal will vary differently from the lessons that you learn. You can take what you want, and leave what you don’t. Can you tell the mistake I made? No? Keep reading! And I didn’t even have a notebook yet! But the experience sticks with me in such a way that I really hope nobody else has to repeat it. When I first learned about bullet journaling, I started researching everything I could right away. One of the pieces of information I walked away with was that a dot grid notebook was best for the task. The other thing I discovered was there was this notebook called a Leuchtturm that everybody seemed to love. So when I finally decided to commit and purchase, I also noticed it was the end of the month. I felt pressure because I believed (wrongly) that if I didn’t have my notebook by October 1st, I would need to wait until November to start. Thus, I was super excited and impatient because I felt like I was on some time limit that didn’t even exist. I scoured through Amazon, found the first Leuchtturm notebook I could find, and ordered it with one-day shipping. I NEEDED it by October 1st. And promptly realized about an hour later that I ordered a plain Leuchtturm notebook. I tried to cancel the order, but when you do one-day shipping, they get the process going very fast. So I realized right then and there that I was stuck, and I was going to have to love what I got because I’d lose out on shipping fees if I returned it. Now, if you make this mistake, I do have a few pieces of good news. If you do order the plain Leuchtturm, they do include a loose piece of paper that has lines and a graph on it. It’s not perfect, but you can use it as a guide for writing and drawing. Starting out is probably one of the most overwhelming times of a bullet journaler’s existence because you literally have to pick something and roll with it. Just pick something and roll with it! And picking something when you have SO MANY OPTIONS to choose from is literally like throwing a dart blindfolded. Oh yeah, and there’s a possibility you may hate the first thing you try. PRESSURE IS ON! So stick with what you already enjoy (aka if you aren’t good at doodling, don’t expect to create expertly designed doodles all over your layout.). And if you really want to try doodles anyway, read how to make doodles in your bullet journal! Also, my friend Sheena created this super awesome planner quiz called ‘What Planner Personality are You?’. Check out the post, take the quiz, and see if it helps you find a direction that you mesh with. Start small. Maybe choose five things you want to try for your first month and see how you handle that. If you feel like you managed it with ease, then add some more the following month. Limit the number of social media accounts you follow for inspiration. It’s really easy to follow 400 different bullet journal accounts only to feel conflicted and not good enough. If picking a handful feels overwhelming, let me make this easier for you! 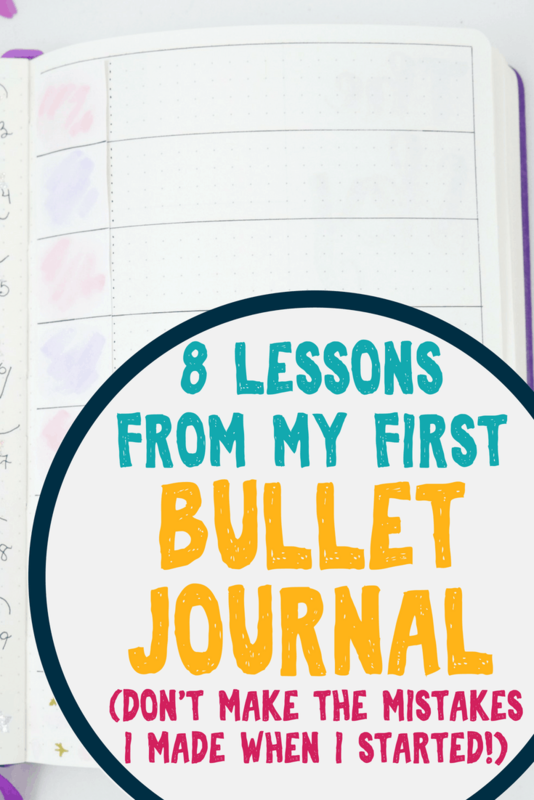 Here are 18 Awesome Bullet Journal Accounts to get you started. What makes this post even better is that all 18 accounts are spread over different blogs and types of social media, so you can select the types that work best for you if 18 is still too many to start with. When you create your entire planner from scratch (not to mention by hand), you are going to make mistakes. Some people realize this early on. Like, even before they start writing in their first bullet journal. It actually paralyzes them to get started. The good news is that 85% of mistakes are preventable or easily fixable. Another 10% of mistakes usually involve some mindset adjustments. It’s really only the remaining 5% of mistakes that could hurt you… and that is generally related to spilling liquid on it or losing it. So if this is a concern of yours, please read ‘How to Accept Making Mistakes in Your Bullet Journal.‘ Get the tools to prevent, buy tools to fix mistakes, and learn the steps to mentally accept the mistakes. 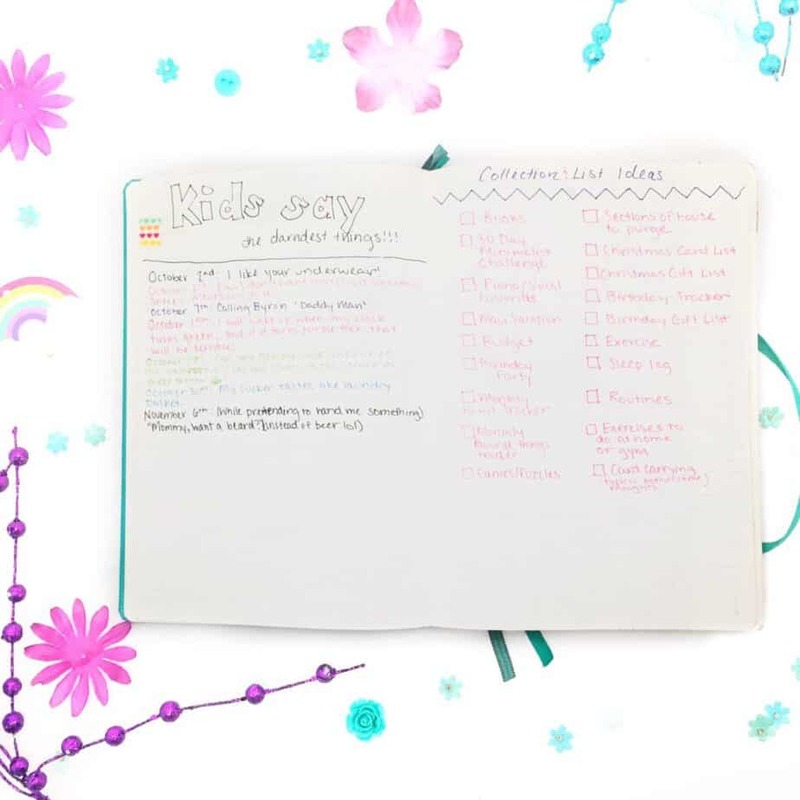 It takes a little bit of time to figure out what you need for your bullet journal. As you get used to making the routine of creating your spreads and checking it regularly, you’ll think of more ideas down the road. And as more people show into the community, you’ll have even more inspiration. You’ll find new ideas and be able to determine quickly whether it’s something worth pursuing or if it won’t work for you. 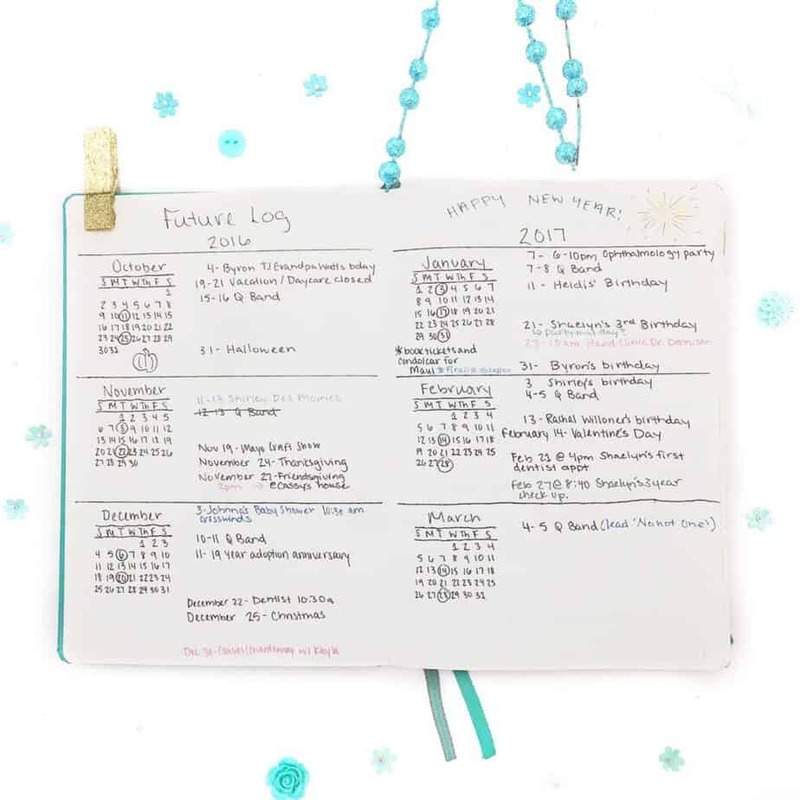 Not to mention, if you are new to keeping a planner, it’s going to take a little while to fall into the routine of using your very first bullet journal regularly. 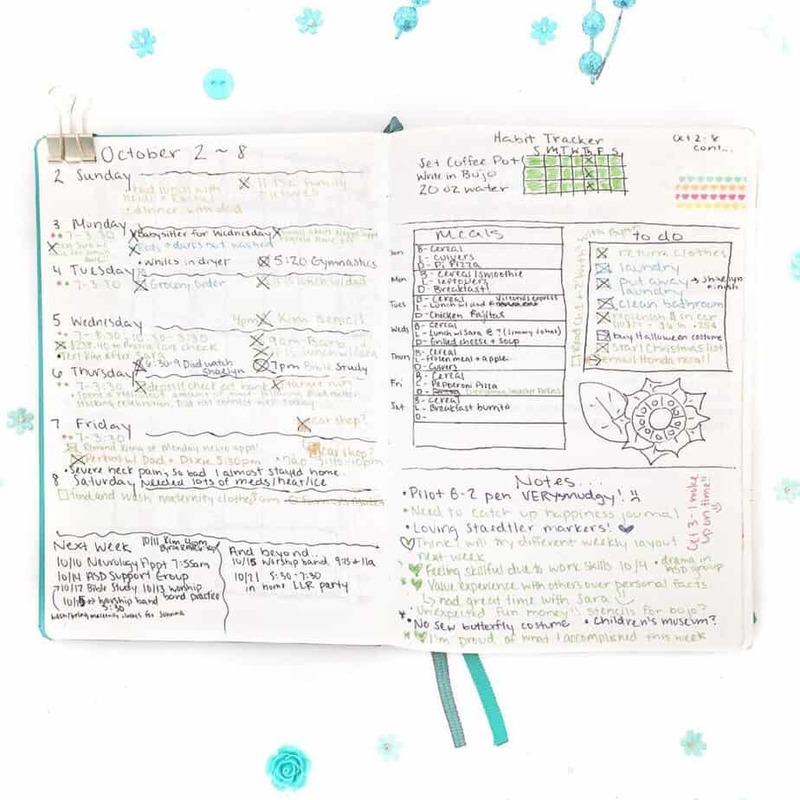 Your first three weeks, you’ll spend too much time on your first bullet journal. Then the next three weeks, you’ll probably forget for a couple of days and panic. For now, enjoy the experimentation process and remember that it’s going to take a few months to get a rhythm down. When you first start your first bullet journal, you want to copy everything you see that you like. This was my first collection in my first bujo, didn’t use it! But Ashlyn has an awesome system that she put on Instagram! Especially when it comes to collections and trackers! Ooh, a TV tracker? I watch TV! Ooh, a cleaning tracker? I clean! Yeah, it’s unlikely you are going to keep up with it. So to handle this hurdle, here are my suggestions. Start with trackers and collections for items you’ve already wanted to work on! Maybe you have never wanted to track television shows, but if you’ve already been trying to find a better system for handling your laundry… that would be a great tracker to start with! Don’t give up when you realize you have something you aren’t going to use. Remember, it’s an experience! Not a contest. Don’t give up if you end up not using something you wanted to use! Sometimes it just takes a different format or simplification to get a tracker the way you want. The other thing to consider, too, is sometimes the bullet journal isn’t the best place for all things you need to collect or track. If it’s not something you don’t already do in some way, shape, or form, you probably shouldn’t do it at first. You can always save ideas to revisit later. You can save Facebook posts, pins, websites, Instagram pictures, whatever. The point is, no matter how you come across something that you like, you are always going to have some opportunity to save it. You aren’t going to lose it forever. This probably seems like a silly point, but unless you are a professional artist, the point stands strongly. I hated my first future log! When you do anything for the first time, it’s probably not going to look the best. I mean, you may actually dislike what you make while you’re making it. Earlier, we discussed the likelihood of making mistakes and how incredibly normal it is. Yet when you are starting out, it’s awkward. You’re trying new things, making new doodles, and possibly using tools that you’ve never used before. Sometimes what you envision just doesn’t turn out the same way on paper, too. If you don’t like what you made, take a deep breath, and try something different for next week or next month. Recognize that everybody has a start, including you. If you continue to work through these moments and get past them, this allows you to grow as a bullet journal artist. So, imagine you’re finally starting your bullet journal, and in one of your communities you start to see people arguing over the ‘right way to bullet journal’. 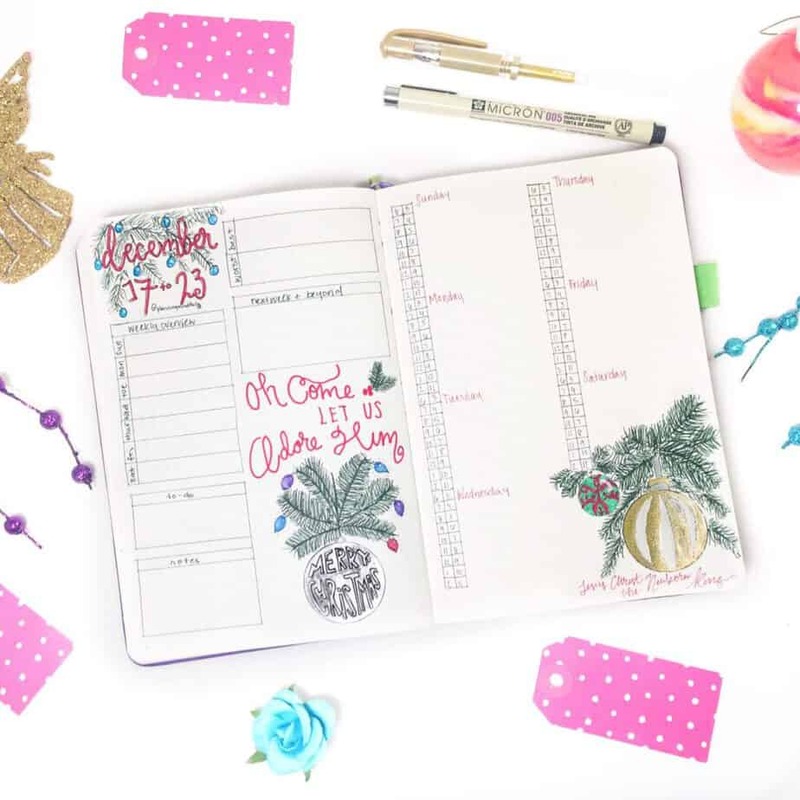 Lily Ann shares one of many amazing ways to bujo! By the way, if you come across this, run away. Plug your ears and yell ‘la, la, la, can’t hear you!’ in the process of running. There is literally no right way to bullet journal. If your bullet journal helps you in any form, then it’s successful. Whether you adorn yours in art or leave it plain as can be, you can literally do whatever you want. If anybody says differently and is rude to you, just ignore it. The concept of the Bullet Journal came from Ryder Carroll. He made famous many of the concepts that people use in their bullet journals today. Realistically though, a bullet journal is just a notebook. It’s just a notebook where you create the structure you need to help you function in any capacity. Sure, I definitely make recommendations and suggestions to make your life easier! However, my way is not the only way. This lesson is a list of the little items that I can’t really write long points about, but may be worth knowing! You’re going to pronounce Leuchtturm wrong. Especially if you are American. Speaking of Leuchtturm1917 notebooks, you’ll find that they ghost. If you don’t know what that is, read the review of the notebook here. If ghosting will bother you, and you don’t use watercolor, get a Scribbles that Matter notebook instead. Same thing, thicker paper! Your notebook will look more beat up as you approach the end of it. Don’t panic about perfectionism! It’s a special place with a lot of fun memories you should hold dear to your heart. There are a lot of confusing terms that exist in the bullet journal world. If you need help, I have you covered with this bullet journal glossary! Ultimately, remember to enjoy the ride. Yes, there will be problems and mistakes. You may even fall off the wagon once or twice. But if you are willing to put those concerns aside and recognize that they are all NORMAL processes that EVERY bullet journal artist deals with, you start to enjoy your bullet journal so much more. You’re going to learn more about yourself. You’re going to make positive changes. You will make some really cool friends if you get involved with the community. You’re going to get better with practice. And you have one other cool thing that I didn’t have when I started. If you sign up for my email newsletter, not only will you get weekly tips and help with anything you may need, but you can ALWAYS send me an email if you’re having trouble. I’m here to help you in any way you need. So click subscribe to get your support, along with news and more right now! 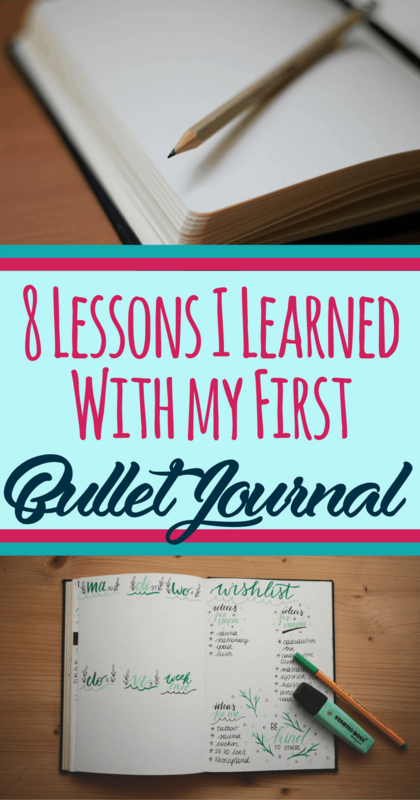 If you already finished your first bullet journal, what lessons did you learn in the process? Please let me know in the comments! I love hearing personal success stories! share them on Pinterest to help others! Hi Cindy! Thank you so much for the comment!!! I love your idea for that “the last time I” spread, and I’ll have to see if I can incorporate it into my notebook. I’ve seen some before, but I know I’m pretty good at forgetting those minor details. Thanks so much! I am just starting my first bullet journal and this was helpful. 🙂 I think I need to relax and let this be the process it is. Awesome mindset, Amanda. I wish you nothing but success, and feel free to reach out if you need anything! so bullet journaling is just basically writing anything down,,,,I paint rocks to hide for people to find they are kindness rocks, would that be something to keep track of? That’s so cool! Yes you could!!! You could track where you left it, defining characteristics of the painted rock, and the date you left it there. Thank you for your article. You have a lovely writing style. Seems like everyone on the planet has a blog and half of them are about bullet journaling! 🙂 As you point out, discrimination and filtering is the key to sanity these days. It’s easy to bookmark but investigating or weeding through 1,000 bookmarks later? I like an app called “Stache”. You can tag/categorize bookmarks and it sync across all your devices. I have no affiliation. I just like it. As for wanting my bulletjournal to look like those posted online and the struggle to accept that it never will – it’s a sickness called perfectionism and I’ve got it lol. One idea is to use 4×6 sticky notes to experiment. A bundle of 1200 is only about $11. At that price, you can afford to practice unconditional sharing by giving a pack to a random stranger. They’re also great for taking notes from books without ruining the moment with electronic device. There are other, more expensive brands but these do the job for me and I like that they’re cheap enough to share (and not to care if I lose a pack). I had another tip to share but I took so long posting this between answering the door to except delivery of my new journal that I’ve forgotten it! (Count your lucky stars.) Again, thank you for your nice post. It makes me feel like Writing a blog. Very glad you found value in the content!!! I’ll definitely check out that app, I feel so disconnected with my bookmarks… seriously so happy you suggested that!! I wish I could utilize sticky notes more but I am the WORST with loose sheets of paper. They are my worst enemy.. but I’ll have to share them with others. I definitely know other people love that type of system. If you ever do start a blog, please do not hesitate to send a contact me if you have questions!!! I have a lot of valuable input if you’d like to know more. Try the Super Sticky Notes by 3M. They stay on you journal pages and even will stay stuck to my dashboard for errands i need to remember to run when my journal isn’t in front of me! Thank you!! That’s great to know. I was unable to the Stache app when I searched, any additional info or advice? I have started many many planners and many bullet journals but never stick with them. I think i start off with to many details mostly when it comes to a key. I also way over think every little detail and never make it much farther. I really really need to figure this out with baby number 2 on the way. I already have way more things to do than i can keep track of. Any tips would be greatly appreciated ! Thank you!! Wonderful article! From a perfectionist and thus one who is always afraid to start that first page for anything, the best words of advice are to jump in and ENJOY YOURSELF! It’s true that mistakes will be made, but you can be creative in fixing those (e.g., washi tape, white out, etc.). Thank you! I’ve been bullet journaling a little over a year, but several months during 2017 weren’t done and it’s still like beginning all over again. I have just started trying to get into Bullet Journals. I’m finding it hard to find the time to make my journal look pretty and stay current. My trackers have days of missing spots that I can’t fill in, and my calendar looks sparse…. 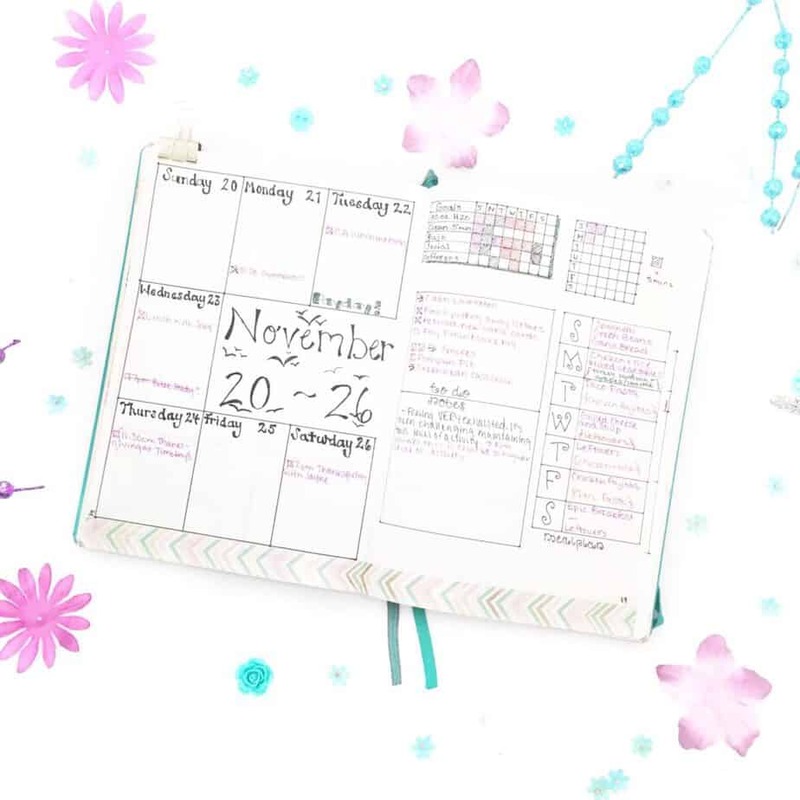 When do you bullet journal? Is there a time of day that works best for you that it becomes habit? I was doing it before bed and noticed some days I’d just be so tired I would give up. Hi Becca! I’ll tell you I’ve had months of my bullet journal being sparse. Sometimes it happens, and can be a symptom of trying to do too much. Maybe consider simplifying your spreads next month. I tend to bujo either before I start work or before I go to bed. Lunch breaks when I used to have a physical job. I’m glad to find your pin from Pinterest. So I’m starting to do a bullet journal. Anyway, thank you for sharing this post.